One of my pet peeves about arguments over the role of money in elections is that the discussion usually focuses so heavily on campaign contributions, while leaving out other intersections of money in politics--like the role of lobbying. To illustrate, here's data on the total cost of elections to the candidates from the ever-useful Center for Responsive Politics its Open Secrets website. 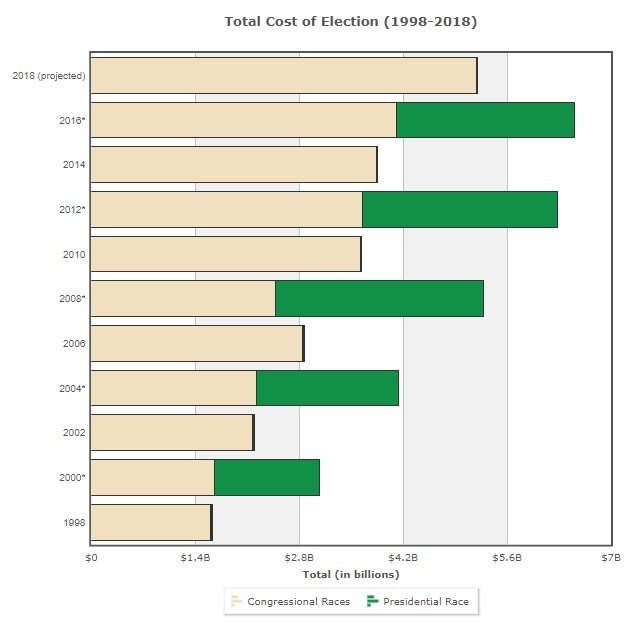 The yellow bars show costs of Congressional elections, while the green bars show costs of presidential races. Thus, this year's election will cost Congressional candidates about $5 billion, while the total cost of the 2016 Congressional and Presidential campaign was more like $6 billion. I'll say in passing that the idea of Congressional and Presidential political candidates spending $5-$6 billion on their campaigns doesn't strike me as all that high, not in the context of a country with 250 million or so adults who are potential voters and an economy approaching $20 trillion. For example, Comcast and Proctor & Gamble, the two US companies that do the most advertising, spent $5.7 billion and $4.4 billion on advertising in 2017, respectively. The Journal of Economic Perspectives (where I work as Managing Editor) ran an article back in the Winter 2003 issue called "Why is There so Little Money in U.S. Politics?" by Stephen Ansolabehere, John M. de Figueiredo, and James M. Snyder Jr., and that still strikes me as the relevant question. But the bigger issue is that we can see pretty clearly what campaign spending goes for: advertising, mailing, travel appearances, and so on. 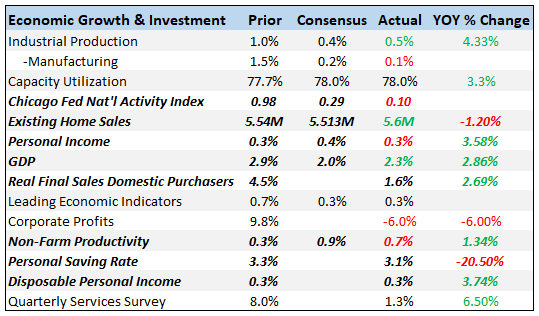 That spending needs to be disclosed and accounted for. Contrary to what a lot of commentary seems to imply, campaign contributions are not personal income to politicians. In contrast, spending on lobbyists is cloaked in mystery. The amounts spent on lobbying are supposed to be disclosed, but what precisely is included in lobbying is often not very clear. The activities of lobbyists, and in particular how they influence or even just write the fine print that affects their employers, does not happen in public. The effects of lobbying are typically not known or disclosed. 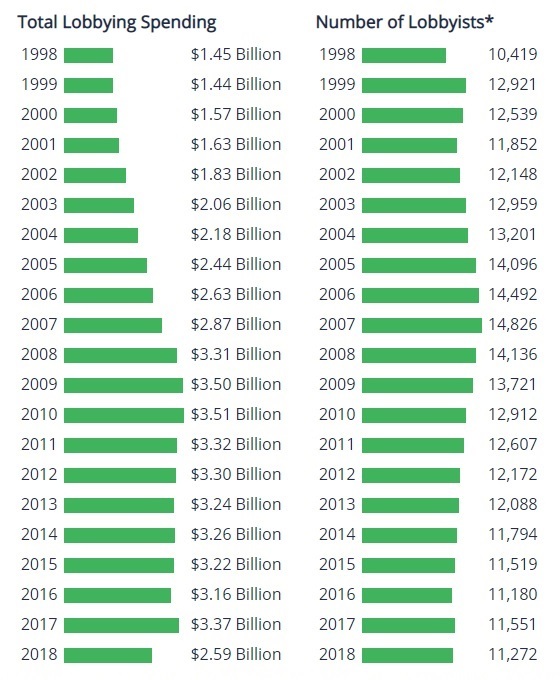 Notice that the spending on lobbying is annual, while the above spending on campaigns is every other year. To put it another way, spending on lobbying doesn't go away in-between elections. Over time, it exceeds campaign spending. And remember that when many politicians leave office, their future stream of income comes in large part from using their political connections and lobbyists--whether they officially register to do so or not. I do worry about whether the low and emotive campaign ads I see, from all sides of the political spectrum, have much effects. Are the people who write and place such ads really understanding what moves voter turnout or voting decisions? But that said, the lobbying that I don't see seems to me a more serious issue for what ends up being written into laws and rules. What should I ask Rebecca Kukla?